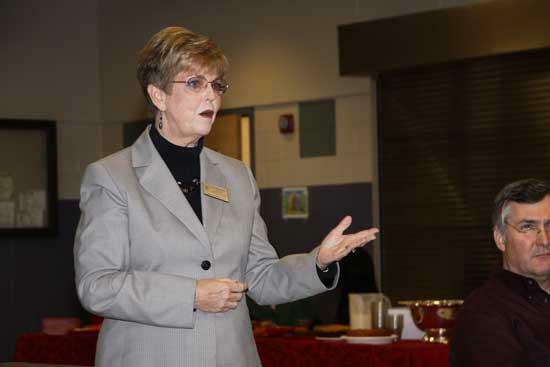 Barbara Corry, Supervisor of Attendance and PBS Coach for Cannon County Schools, reviews the system's School-Wide Positive Behavior Support (SWPBS) program Thursday night for the school board. Fortunately for Steven Porter, and his music students, the Cannon County Board of Education does not penalize people for being tardy to its meetings. Porter, the music instructor for county schools and band director at Cannon County High School, was scheduled to appear before the school board at its monthly meeting Thursday night, which was held at Woodbury Grammar School. He was slated to make a number of requests of the board, the major one being an expenditure of $9664.19 to purchase a timpani ($5371.99), a tuba ($1,829 new or 1,463.20 used) and a saxophone ($2829.00). Despite not being able to make it to the meeting in time to make his pitch, the board's action on the instrument purchase was surely music to Porter's ears when he heard of their decision. Board Chairman Randy Gannon made a motion to approve the purchase, it was seconded by Roy Parker, and the board voted unanimously to do so. At the school board's Tuesday workshop, Porter said, "the entire Instrumental Music Program in Cannon County will benefit from these instruments, not merely the High School. There are many aspects of Instrumental Music that are not known to the 'general public' because of the lack of emphasis on Instrumental Music." Porter says studies show music enrichment programs can boost overall student performance. "I am asking for help in getting the right tools in the hands of the students that use them," Porter said Tuesday, and on Thursday the board gave it to him. In another music education-related item, Porter was to give the board an overview of the high school’s new recording project Thursday. He did so at Tuesday's workshop. "We are converting one of the practice rooms in the band room to a recording studio available to the public and Cannon County High School students," Porter said Tuesday. "This combines English, Foreign Language, Science, and Music with cross-curricular activities such as, but not limited to: visual understanding of sound waves/acoustics of sound; translating lyrics; putting music to prose/poetry written by students. The equipment has been purchased with a grant from Cannon County Youth Dream. "In addition, this gives Guitar Class an opportunity to experience the process of recording giving a hands-on approach," Porter said. Also on Porter's part of the agenda was a request to send a letter to businesses in Cannon County seeking their support for the annual Cannon County Fine Arts Festival 2010, and the board had no objection to him doing so on Thursday. Cannon County’s Fine Arts Festival will be Tuesday, March 16, 2010. The Festival will include students from all seven schools in Cannon County (Auburn, East Side, Woodbury Grammar, Woodland, Westside and Short Mountain). Porter says art teachers are collecting works and projects from their students to go on display in the Robert A. Harris Gym at Cannon County High School. There will be three judges to award 1st, 2nd, and 3rd places, as well as “Honorable Mention,” in the following category grades: K-2, 3-5, 6-8 and 9-12. Some Grade Categories will have subheadings like: Computer Graphics, Ceramics, 2-D Art, 3-D Art, Drawing, Water Colors. “We have 82 students involved with the Instrumental Music Program in Cannon County in grades 6th-12th. Instrumental students in grades 6th-12th will participate in a Master’s Class from 8 a.m.-2 p.m. at Cannon County High School,” Porter said. “This is a class that is specific to their instrument/voice and focuses on fundamentals, technique, and practice methods. Porter is asking businesses for any help that is available. All proceeds/donations go to the Fine Arts Festival. The money will be used for prizes for the Arts Awards (Gifts from Michael’s, Hobby Lobby, etc. ); Fees for the Clinicians, and Lunch provided for the students and Clinicians. The Clinicians are members of University Faculty, Recording/Session players, and/or Touring/Professional players. • Revisions to the Prom Rules for CCHS students. The major changes involve the dress code and the manner of dancing. Although board members Chris Blackburn and Shannon Davenport expressed their desire for some additional amendments pertaining to prom participation eligibility with respect to in-school and out-of-school suspensions, they agree to table their amendment requests until a future meeting and approved, along with the rest of the board, this year's rules. The prom rules for 2010 are listed at the end of this article. • Tabled the offer of Schnieder Electric Company to conduct an Energy Analysis Report for the school system. Gannon made the motion to table the decision to have the report done because he wants the Cannon County Commission to approve it before the school board does. Since the school board can not borrow money, and the report would cost roughly $45,000, Gannon wants the commission to give its approval for funding the project before the school board takes final action. If both the commission and school board agree to have the report done, and then moves ahead with the company’s plans, Schneider Electric will act as a contractor and will bring in sub-contractors to do certain repairs to the different schools to make them come into compliance with what the company says will save the school system and county money. They will have their engineers come in to inspect the buildings, and then draft a plan to save that particular building money on electrical usage. Schnieder Electric representatives have attributed the County's above average energy consumption to antiquated equipment and lack of funding to upgrade. Schnieder's proposal includes a savings guarantee, with both the total cost of the new system and the projected savings each falling somewhere between $900k and $1.2 million, so the system essentially pays for itself over a 15-year period. If the school system does not take the project the system will have to pay the amount. If the system does take on the project the money will be absorbed into the total loan. Schneider will make the application for the initial grant which would pay for the initial inspection and they will be there to help attain other grants for the schools for this project. After the initial inspection Schneider will show the county how much they will save each year on power bills. Snhneider will guarantee 85% of the yearly loan payment to the lending organization; and if the savings fall short of their projection the company will write a check in an amount that would bring the amount up to their prediction. • Heard from CCHS teacher Crystal Foster, who is planning on offering a Virtual Enterprises course at the school beginning on the Fall, and is working on a grant to purchase materials and equipment for the class. The board gave its approval for the grant application to be submitted. "A lot of great things can come from this and I wish they had it when I was in high school," Gannon said. Foster said the focus of the class is on "the ins and outs of running a business. It's everything you need to know about how to start and operate a business." Blackburn also said he would have liked for a course of this nature to have been available when he was in school. "I am self-employed and now I am getting it through the school of hard knocks," Blackburn said. Virtual Enterprises (VE) is a simulated business that is set up and run by students with the guidance of a teacher/facilitator and a business partner. This program allows students to experience all facets of being an employee in a firm in an actual business environment. Students are involved in every aspect of a running a business, including human resources, accounting, product development, production, distribution, marketing and sales, and they engage in trade with other practice firms (VEs) around the world. This simulation enables students to understand how employees, workgroup teams, and departments interact with each other and work together for the goal of the company. In addition, the simulation conveys the expectations of the workplace. The Virtual Enterprise is a comprehensive and student-oriented approach towards teaching and learning that provides practical and task-oriented instruction in a real-world environment. With communication links to nearly 3,000 VE firms around the world, the program exposes students to different cultures, business practices and currencies and gives students a broader international perspective. Students engage in hands-on applications, problem solving, and written and verbal communication. In addition, students learn about a variety of careers associated with business, acquire global economic knowledge, and use technology as applied in business. By combining a rigorous curriculum with hands-on application of many academic skills, VE aims to prepare students for both careers and college. The task-based curriculum includes a strong academic component focused on writing, speaking, math and technology skills. The program seeks to motivate students by setting high expectations and showing them the relevance of their education. • Received an report from Barbara Corry and Connie Foster on the school system's School-Wide Positive Behavior Support (SWPBS) program. Corry said the county's SWPBS program is one of only three in the state that is systemwide. SWPBS is nationally recognized, researched-based, and designed to enhance the capacity of schools to educate all children by developing school-wide, non-classroom, classroom, and individual student discipline systems. SWPBS requires schools to define, teach, and reinforce school rules to create a positive school environment. SWPBS focuses on prevention and teaching expectations in order to provide a predictable, safe, positive and consistent environment. Students are able to earn “rewards” for various positive behaviors, including perfect attendance and taking pride in school appearance. Rewards are given to students when they are seen following one of the school rules. Rather than focus on inappropriate behavior, the provisions of SWPBS allows the staff at each school to recognize appropriate behavior from its students. The process focuses on improving a school’s ability to teach and support positive behavior for ALL students and staff. Attention is focused on creating and sustaining primary (school-wide), secondary (classroom), and tertiary (individual) systems of support that improve lifestyle results (personal, health, social, family, work, recreation) for all children and youth by making problem behavior less effective, efficient, and relevant, and desired behavior more functional. • Approved a number of field trips, including one to MTSU by 20 Cannon County students by Debbie Frisby, Coordinator and Cannon/Warren County Student Advisor for the METS program at MTSU. METS stands for MTSU Educational Talent Search and is an educational enhancement program funded my the U.S. Department of Education. It is a component of MTSU and serves 6th through 12th grade students in Cannon, Coffee, Grundy and Warren counties. It guides students through the financial aid process by helping them locate local, state and federal monies while motivating them to set and pursue achievable career and educational goals. Along with educational and financial aid counseling, METS provides participants with many opportunities to attend field trips to Tennessee colleges and area businesses, thus helping them explore a variety of options. METS advisors inspire participants to invest in their futures and achieve their fullest potential. More than 95 percent of students who participate in METS graduate from high school, and 79 percent go to college. More than 65 percent receive financial aid and/or scholarships to attend college. 1. Only eligible Juniors and Seniors attending CCHS may attend the prom. 2. In order to be eligible to attend the prom, all school debts must be paid in full prior to purchasing a ticket. 3. Students who have been placed in Lion Academy during the school year may not attend prom. 4. Students who have zero tolerance type offenses committed during the school year may not attend prom. 5. Students must be passing at least four subjects at the semester break to be eligible to attend prom. 6. The deadline for purchasing a prom ticket will be March 10, or two days after we return to school should the deadline be a snow day. 7. The principal/prom committee may deny any student the right to attend prom after their ticket has been purchased if a serious behavior incident occurs. Prom ticket will not be refunded in this case. 8. Students must wear formal attire to the prom. Dresses should be of modest neckline and hemline. If you have any question about your dress, please bring a picture of your dress for the prom committee to review. 9. Male students attending the prom must keep their shirts on at all time. 10. Any inappropriate dancing or lewd conduct will not be tolerated at the prom. 11. All school rules apply during the prom. 12. Students must arrive at the prom by 7 p.m.
13. Once students leave the prom, they are not allowed to return.